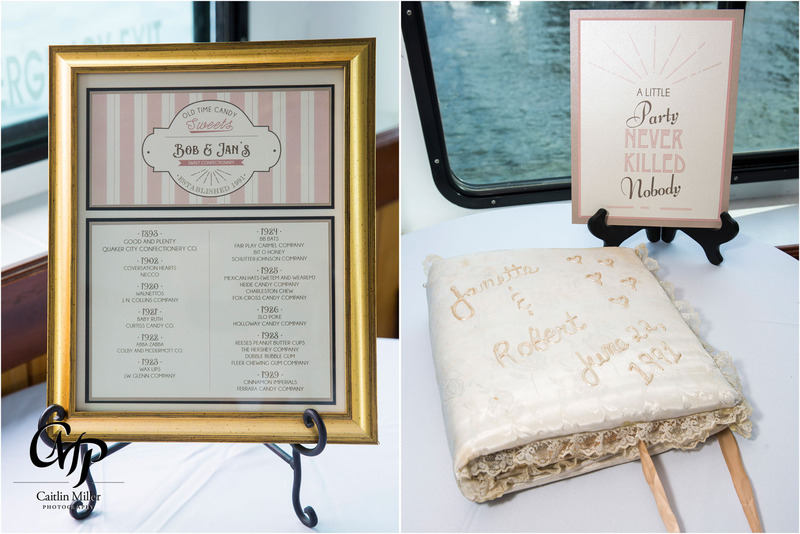 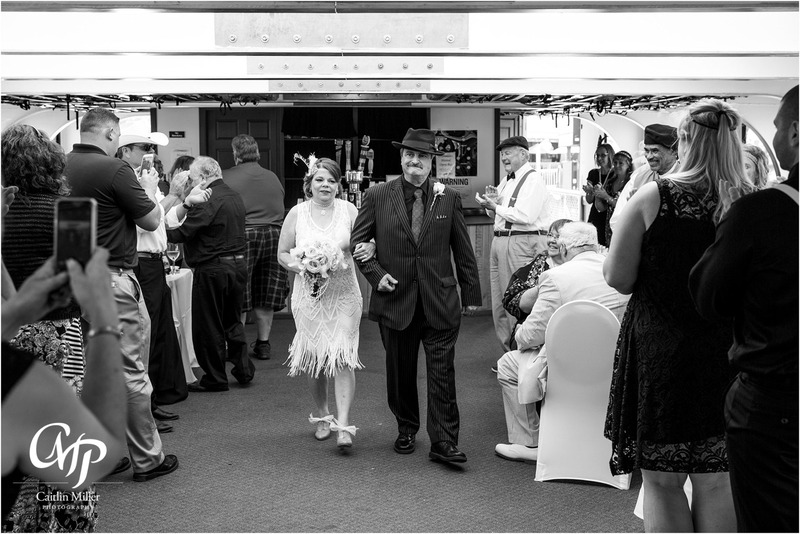 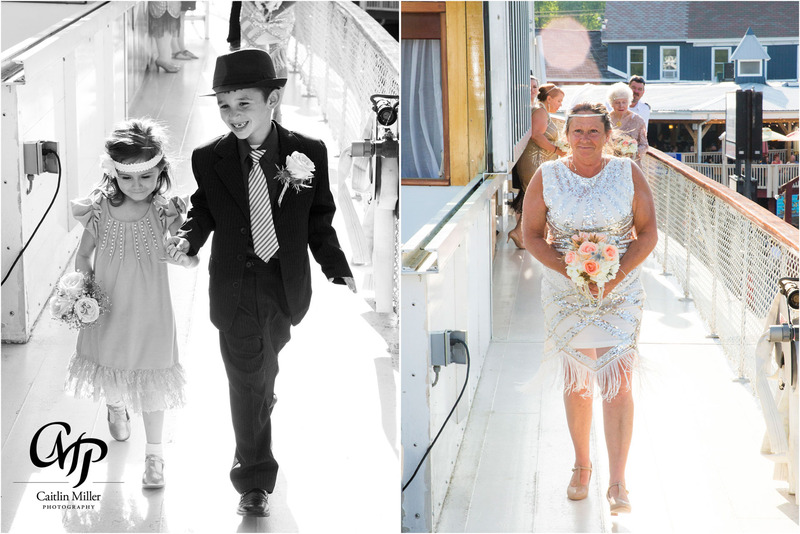 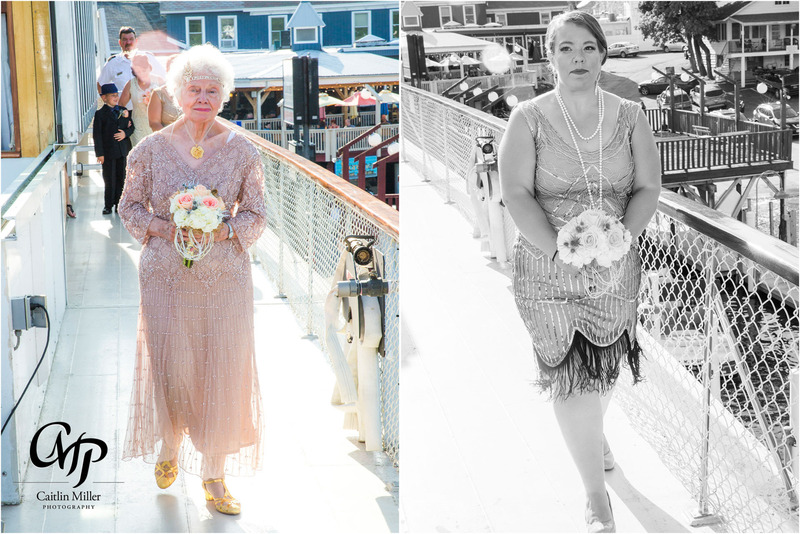 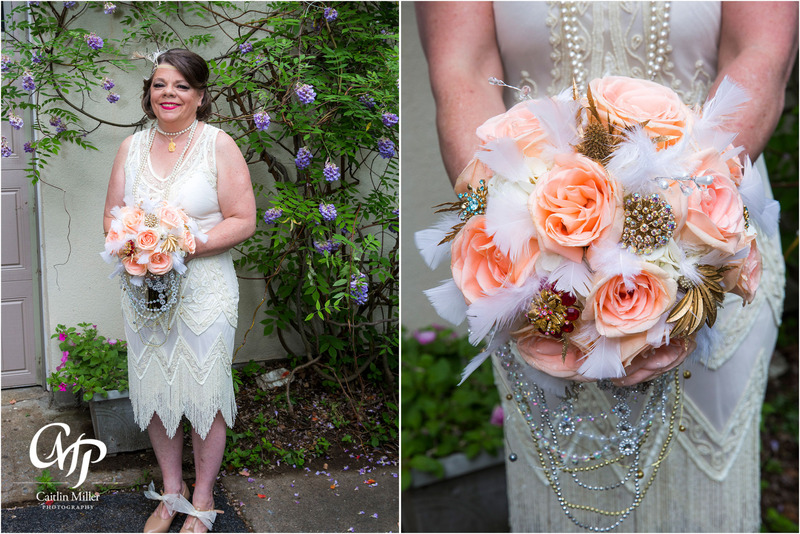 Decor: The Kingsbury Printing Co., Inc.
Jan and Robert’s awesome 1920’s themed vow renewal began on a warm and sunny afternoon in Queensbury, NY. 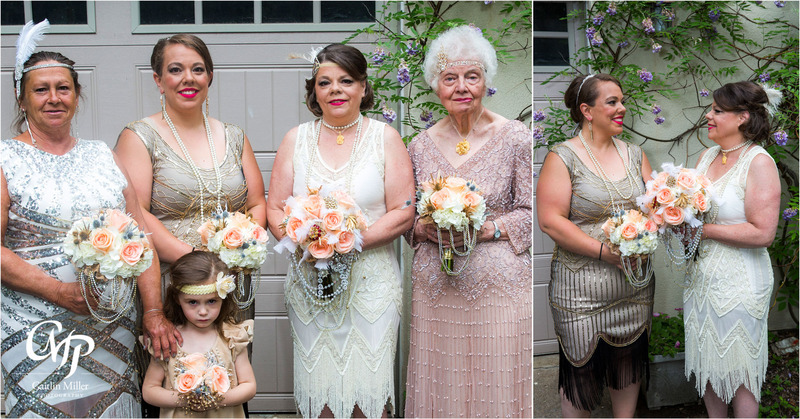 Jan and the girls dressed in their flapper style dresses; Jan’s being all white and covered in beautiful detail. 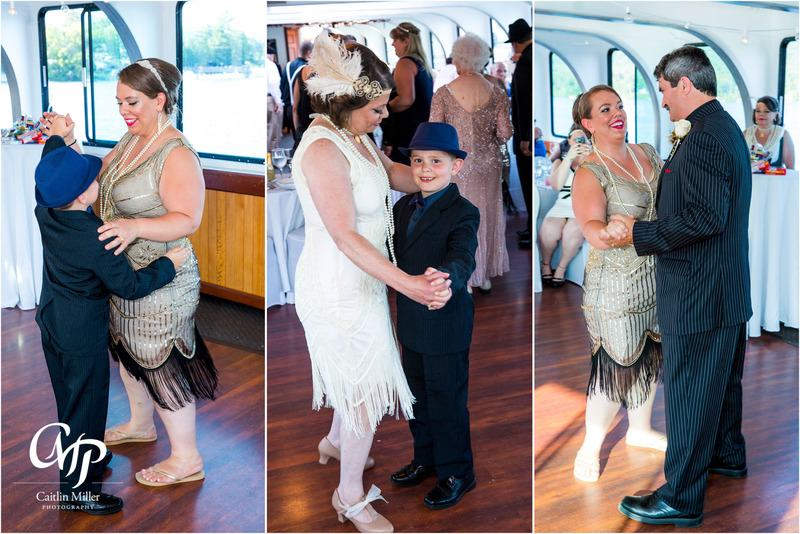 No detail was overlooked from headbands with feathers to 1920s era shoes. 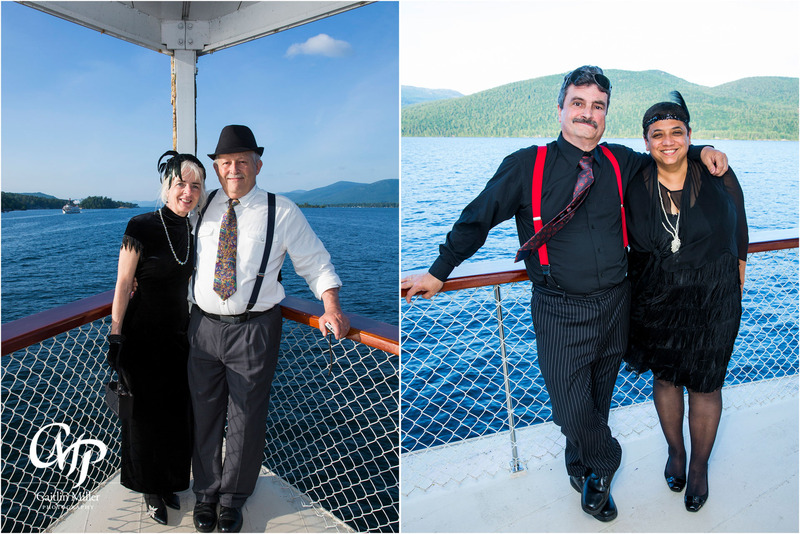 After some quick formals by the rose garden, the ladies headed to Shoreline Cruises’ Adirondac boat on the beautiful waters of Lake George. 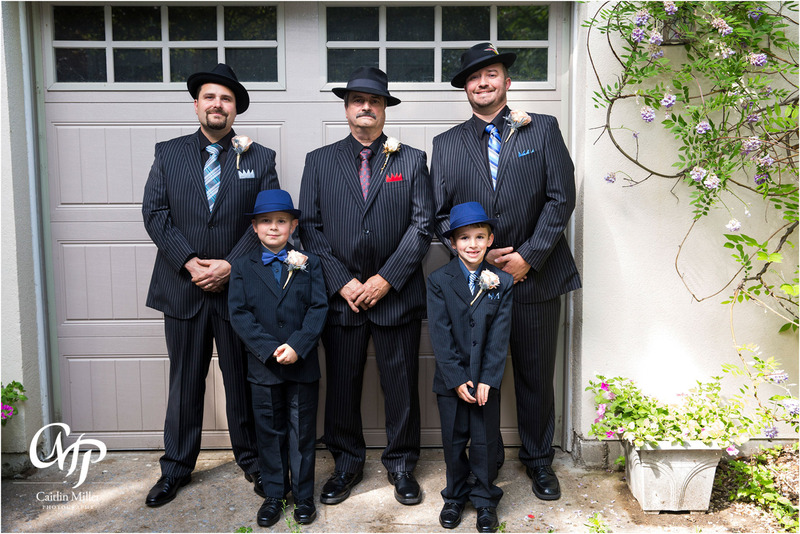 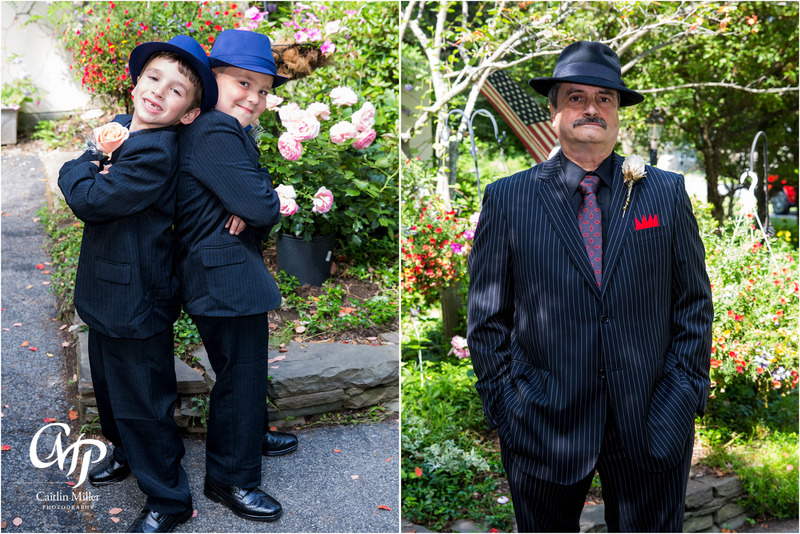 Robert and the boys, dressed in pinstriped foot-suits and fedoras looked even bit the 1920s gansters as they posed for their set of formals before heading to the Adirondac boat themselves. 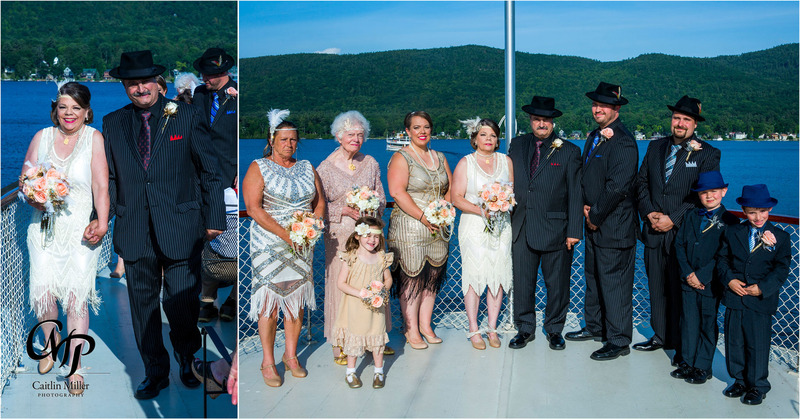 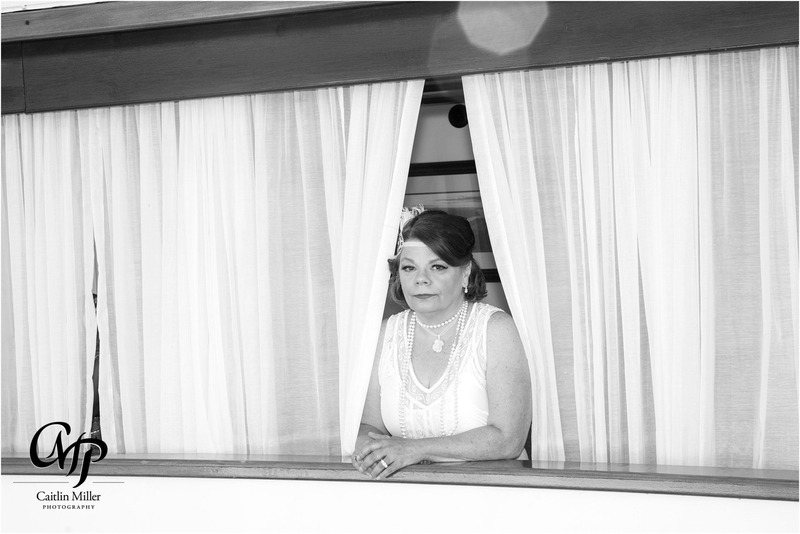 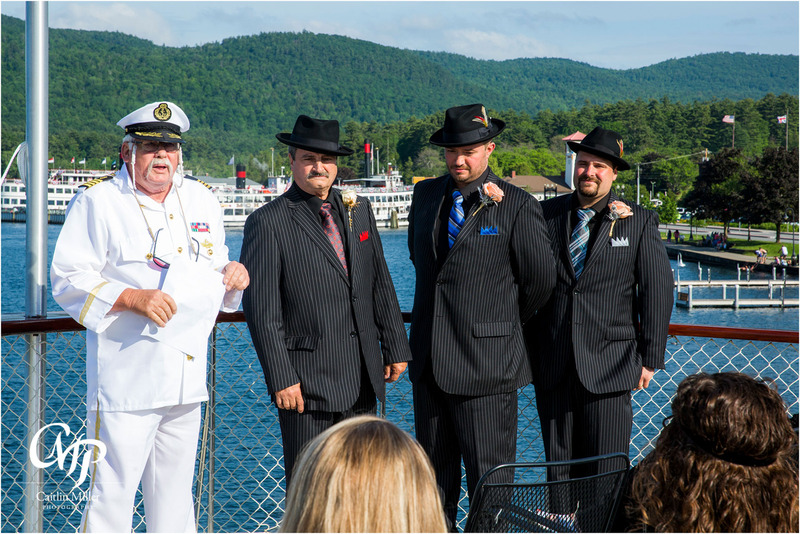 Awaiting us on Lake George, the cruise boat welcomed flappers and gangsters alike for the vow renewal ceremony on the upper deck. 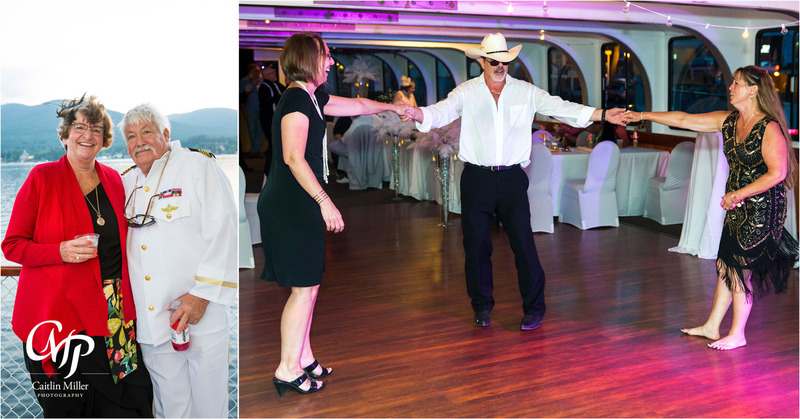 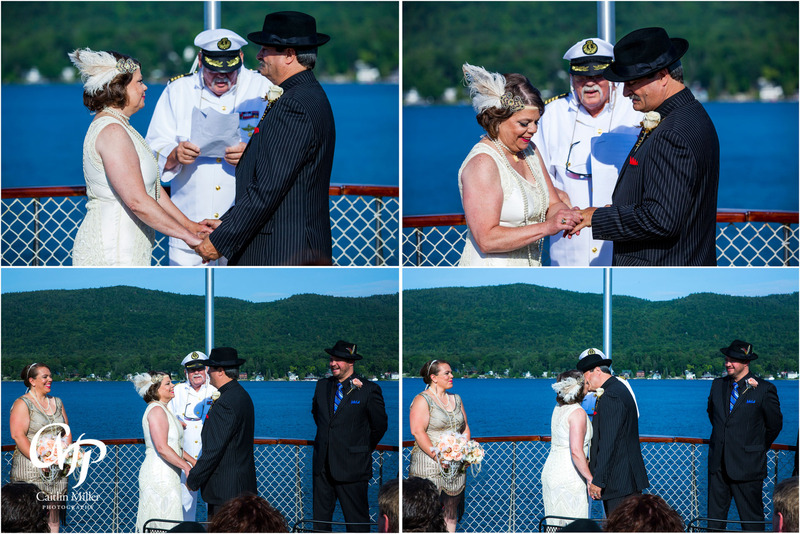 The ship’s captain held a beautiful ceremony, where Jan and Robert once again exchanged symbols of their love in front of friends and family. 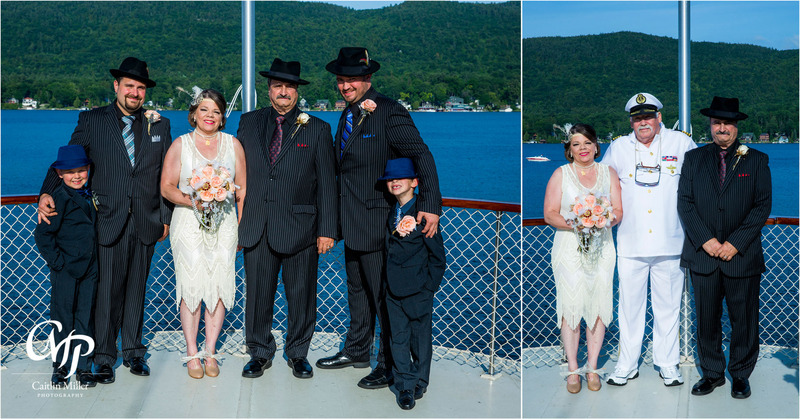 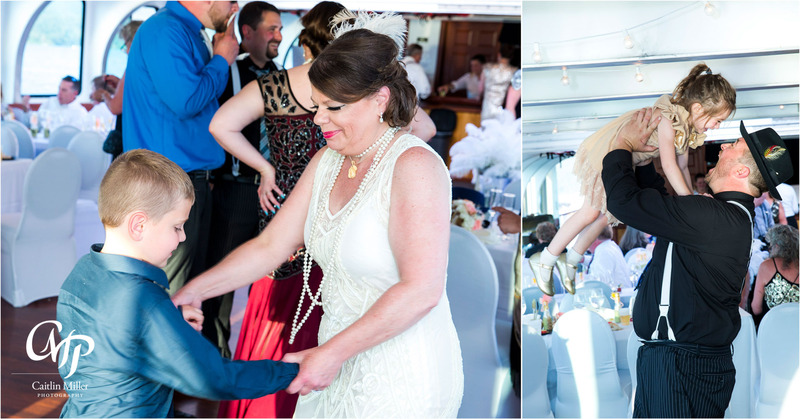 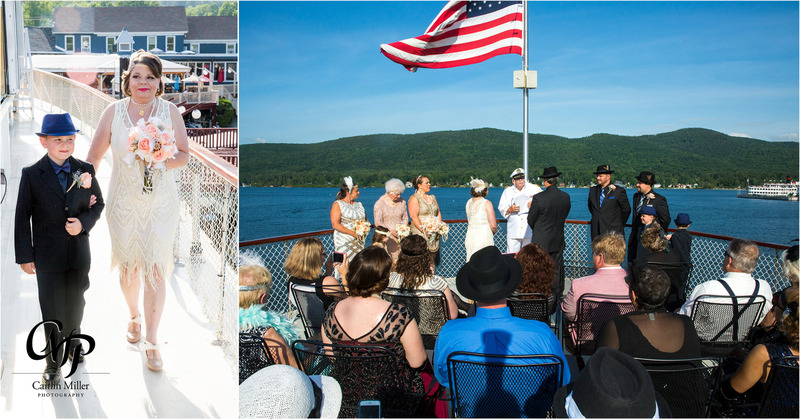 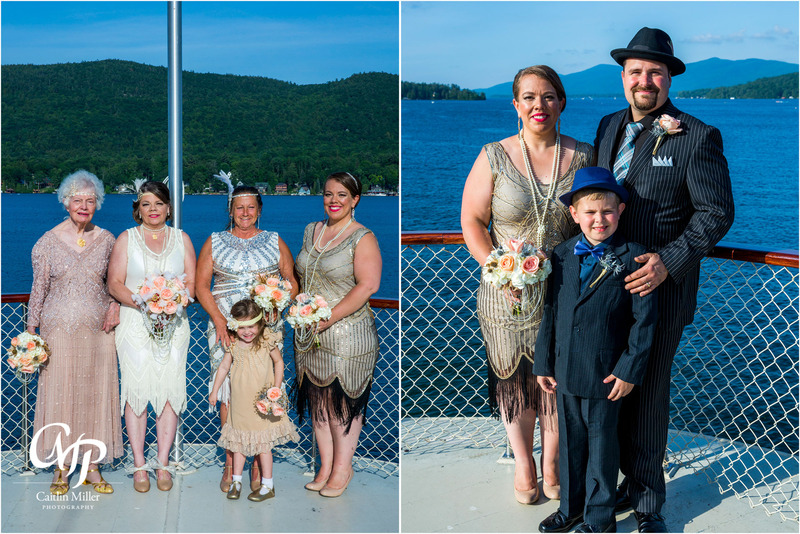 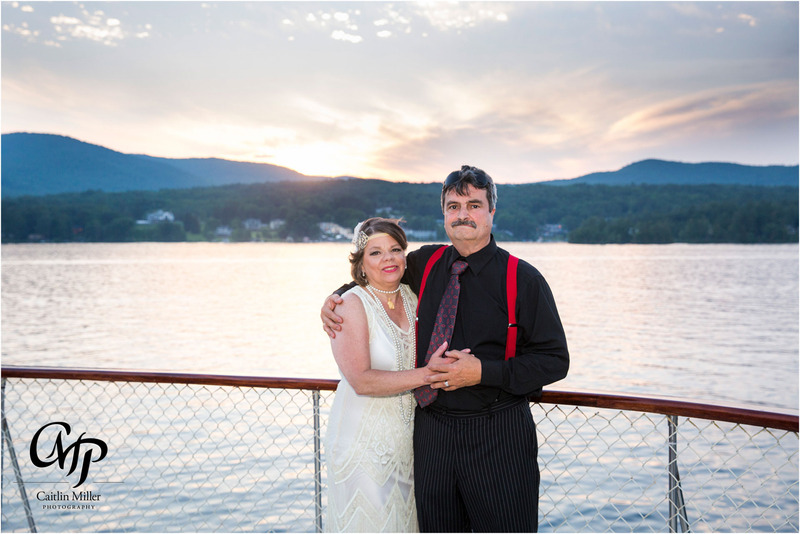 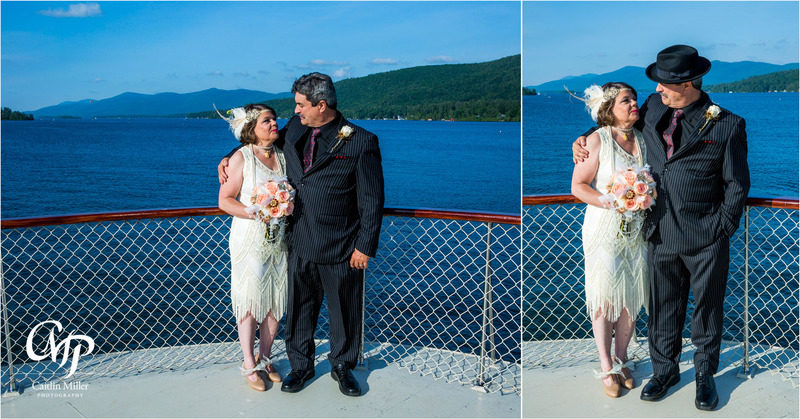 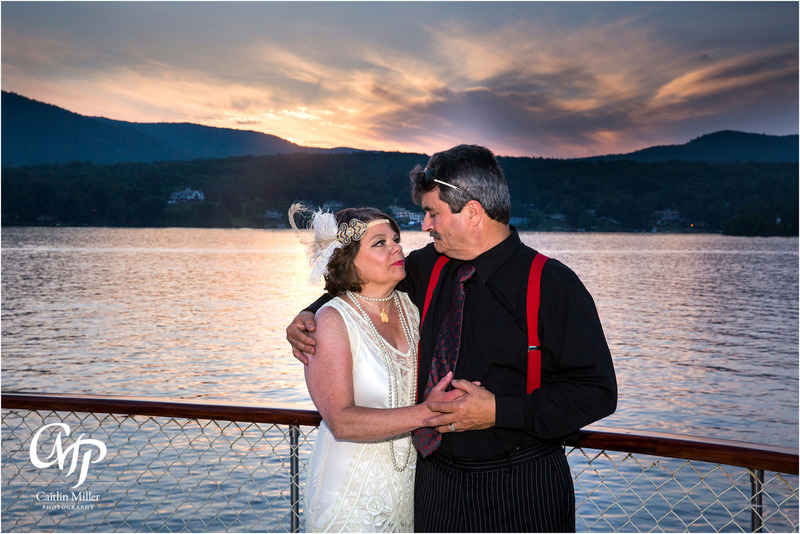 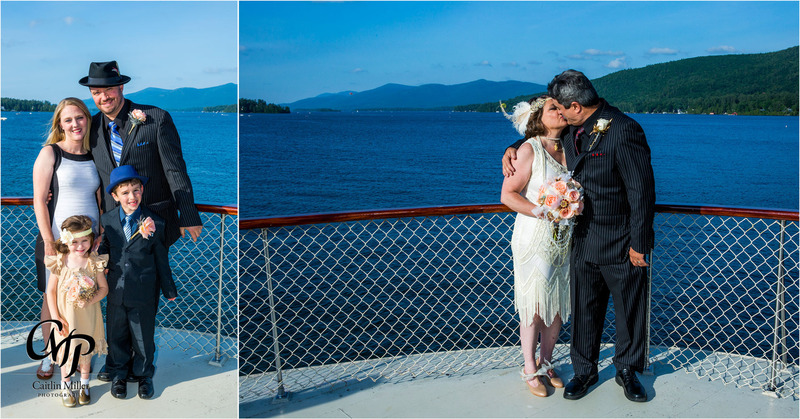 Following the short ceremony, guests joined cocktail hour in the Adirondack boat ‘s main dining room, while Jan and Robert took formal photos with family with the lower basin of Lake George as a stunning backdrop. 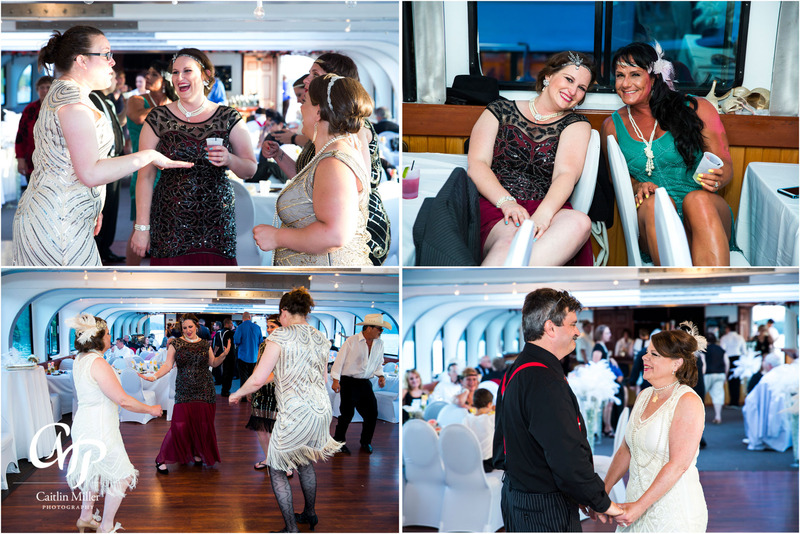 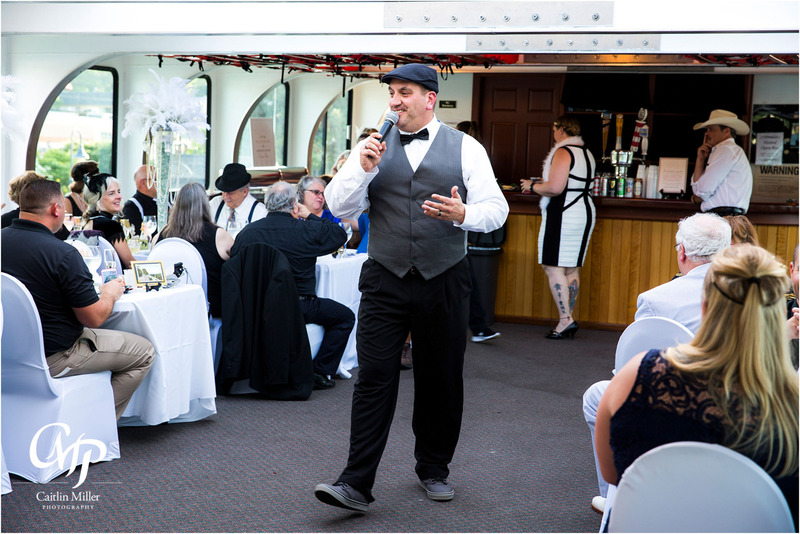 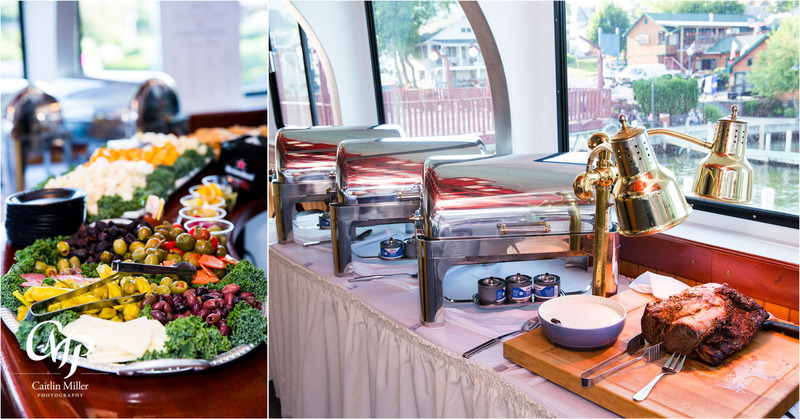 A fun-filled, themed reception followed, led by Total Entertainment’s DJ Mark and his team (who dressed in the 1920s theme as well — how fun!). 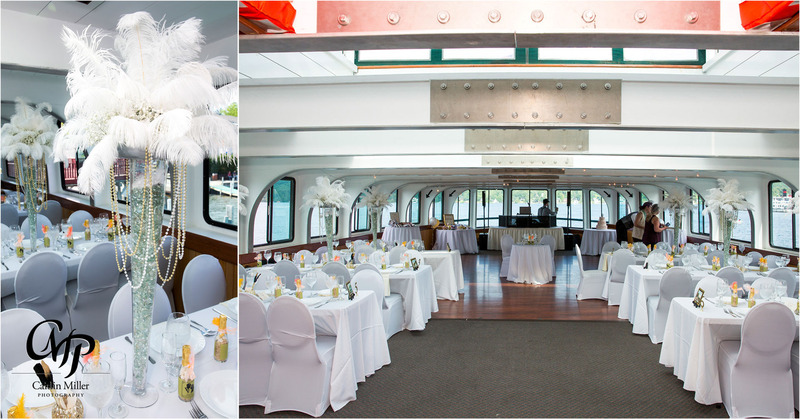 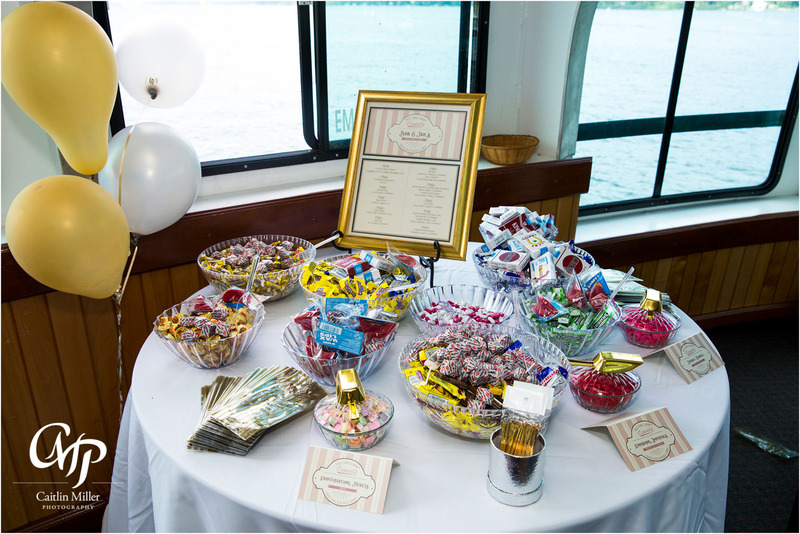 The dining area was decorated by Kingsbury Printing, with custom 1920s era signage, candies and feather coated tables. 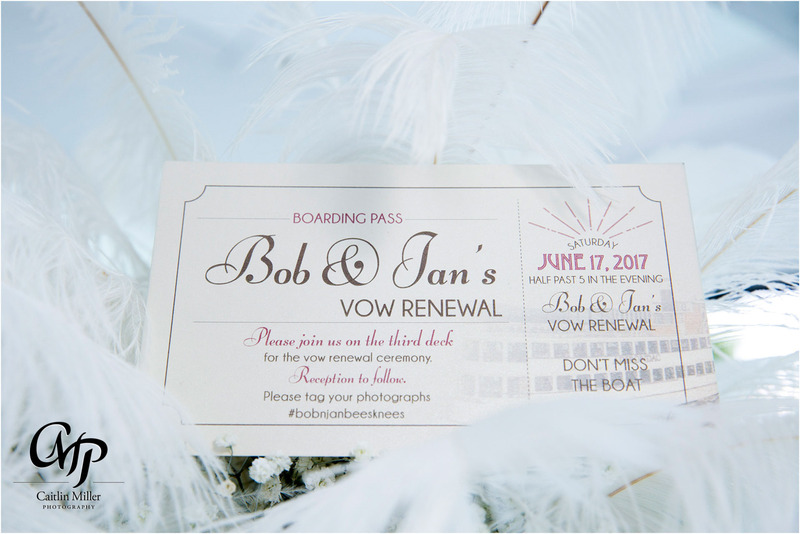 They even made unique boarding passes for the cruise! 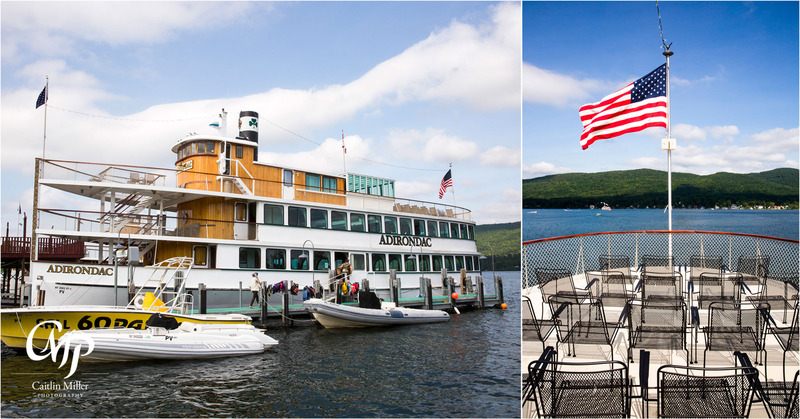 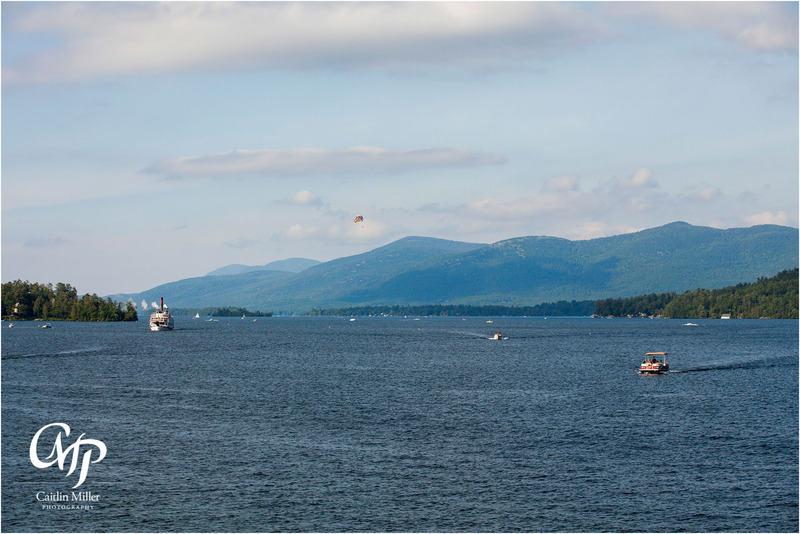 Dancing and laughter filled the next few hours, as the Adirondac boat cruised the waters of Lake George, slowing only to turn in front of the famous Sagamore Resort and return to Lake George Village. 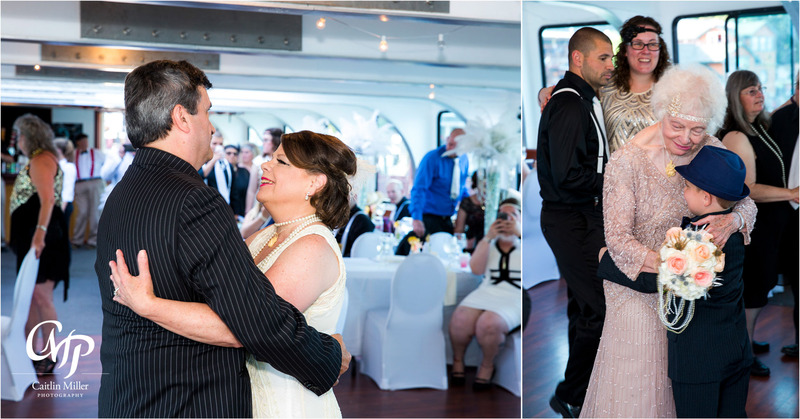 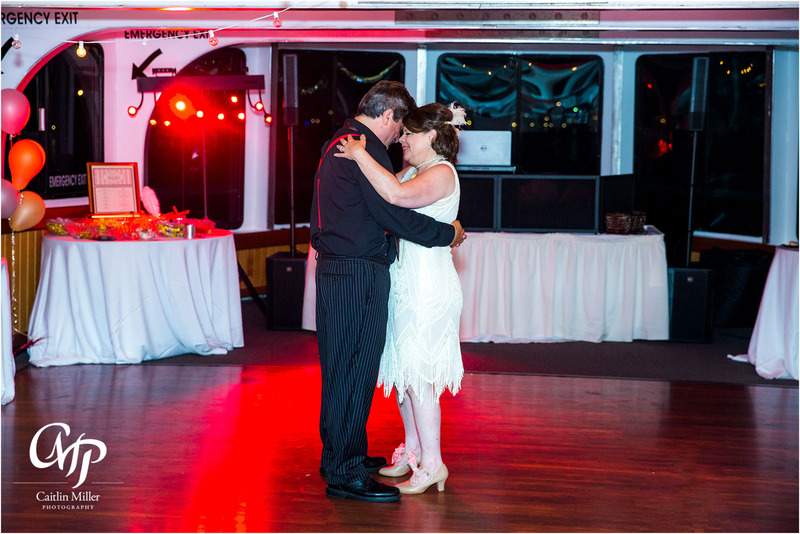 Jan and Robert shared one final dance alone in the dining room, before joining guests on the top deck to view the Lake George fireworks. 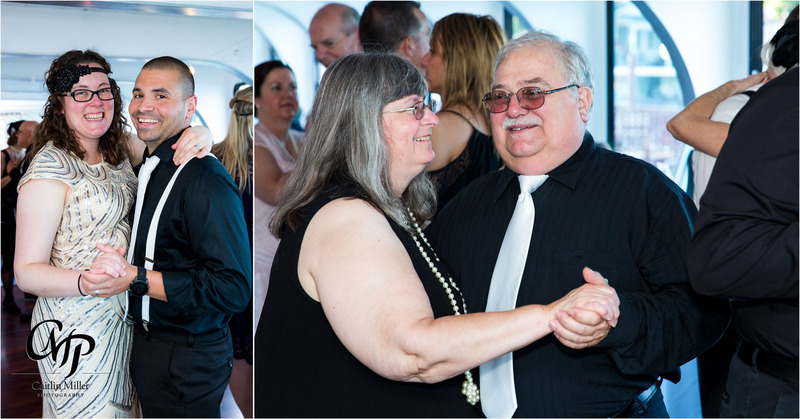 Congratulations for the second time to this great couple — here’s to the next 25 years!